If you’re thinking of joining in on a Parkrun or blazing your own trail through a local park, it might seem like a great option to take your pet pooch along. 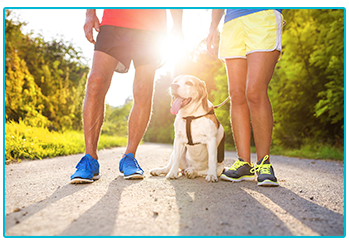 Having your dog alongside you could give you the encouragement to pick up your pace whilst also giving your pet some fantastic exercise! There a few things that you might need to know before going running with your dog, especially if you intend to join in an organised Parkrun. 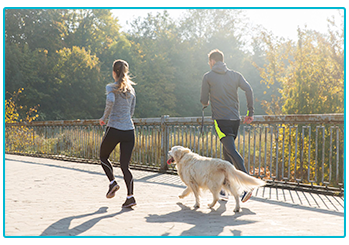 At The Insurance Emporium, we want you and your pet to have a magical time on your exercise adventures, so we put together this guide on running with your dog! If you are intending on taking your dog along to an organised Parkrun then you might want to check their guidelines on pet participation. Some Parkrun’s do not allow dogs whilst others have strict rules to keep things fun and safe for everyone! 2. Make sure that your dog can do it! 3. Check with the vet! If you’re unsure of your dog’s suitability for this type of exercise then check with your vet first! It might even be worth speaking to them anyway to see if they have any advice, such as dietary changes, based around the increase in exercise. This advice could apply to both you and your dog! Rushing into a 10km run at full pace probably won’t do either of you any good, just take it easy and you might be feeling like Mo Farah in no time! This is especially important if you are participating in an organised Parkrun. Your dog should always be on a lead so that they don’t stray off and cause mayhem! Nobody wants a pile-up of fallen runners! 6. Canicross it? Yes, you can! 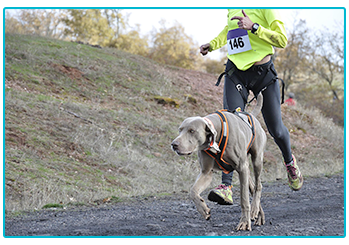 Speaking of leads, Canicross is a sport in which the human participant wears a waist belt which is attached to a bungee lead. This could be the perfect item to use when taking your dog on a Parkrun! This should go without saying for most dog owners really! If your dog happens to do their business on the course, pick it up! Slipping on a pile of dog mess is not something that you’d wish on anyone! This is another one that could apply to both you and your dog. Keeping yourselves hydrated both during and after your Parkrun is vital. This is particularly important on sunny or hot days, so ensuring that you have something for your dog to drink from is key! The most important thing with any exercise regime might be simply to make sure that you enjoy yourself! Once you’ve fully learned what your dog can handle, you might find yourself with the perfect exercise pal for some fun adventures in the park! Letting your dog join you at Parkrun, or take part in any kind of exercise for that matter, could be the perfect way to involve your pet pooch in your adventures and get fit! You might also want to consider getting some Dog Insurance to help protect you if anything goes awry. At The Insurance Emporium, all of our new Dog Insurance policies include a 20% Introductory Discount* and include Standard Benefits such as Vet’s Fees up to £8,000**. Run along to The Insurance Emporium today to find out more! *20% Introductory Discount only available for the first year of new policies. **Vet’s Fees up to £8,000 available on Lunar Monthly Lifetime Gold policies. This blog is in no way sponsored, endorsed or administered by, or associated with Parkrun Ltd.